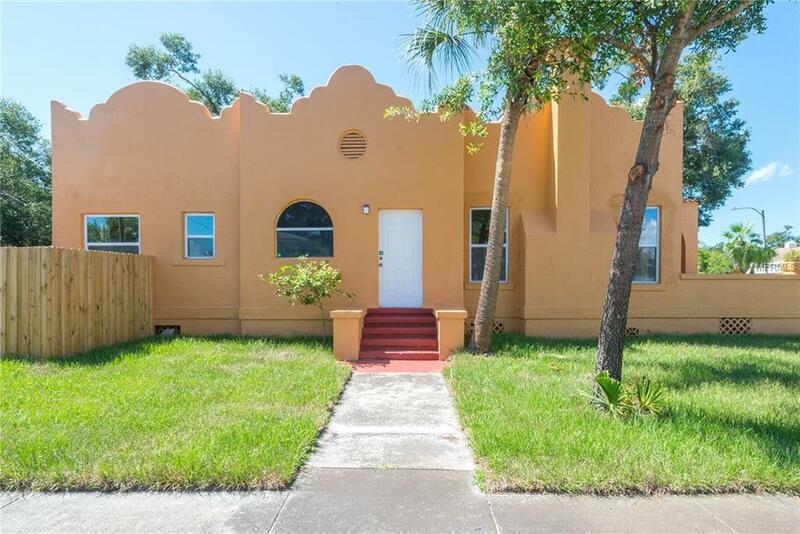 Beautiful Spanish style home in St. Pete! This gorgeous one-of-a kind home offers stunning architectural details and classic historic charm. The original wood flooring, wood burning fireplace and large windows make the space warm and inviting. The spacious main living area is punctuated with arched doorways, glass french doors and beautiful crown molding. A large kitchen offers plenty of counter space and you will love the granite counter tops, stainless appliances and new cabinetry. Upgrades include: Solid wood cabinets, granite counters, new appliances, new interior plumbing, new water heater, bathroom shower tile, carpet, windows, vanity's, light fixtures, ROOF, water heater, exterior and interior paint, fence. The spacious bedrooms offer ample storage. Outside, the private fenced in yard is the perfect spot for enjoying the Florida outdoors. Plenty of parking for a boat or RV on this oversized lot. Located conveniently close to Downtown, beaches, retail, fine dining and all the area has to offer. Come see this amazing home for yourself today.